Let’s talk about potatoes for a minute. They are totally unfairly discriminated against, especially this time of year. You guys, white potatoes are just as much a nutritious whole food as sweet potatoes! Want proof? White potatoes are an excellent source of both vitamin C and potassium. They also provide fiber, vitamin B6, and are low in sodium. And when prepared in a healthy way, like roasting, potatoes are a super nutritious and delicious addition to meals! 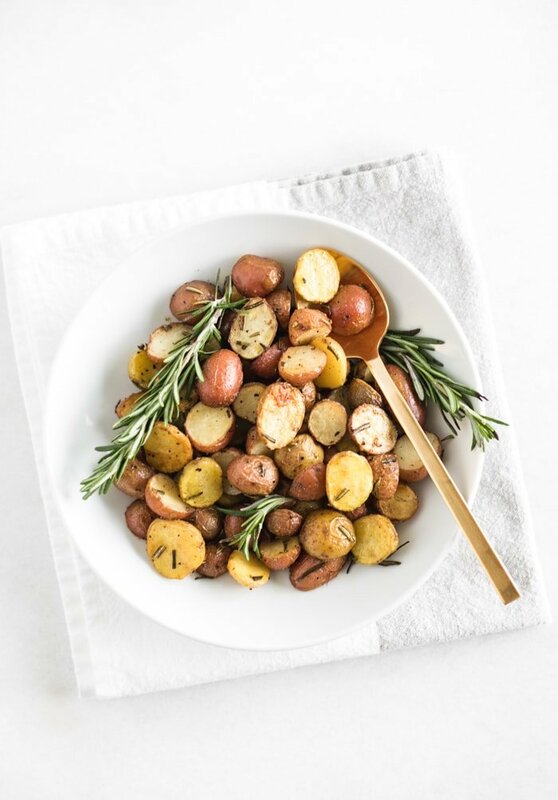 These oven-roasted rosemary potatoes are one of my favorite potato side dishes. They’re so easy to make, and taste amazing. 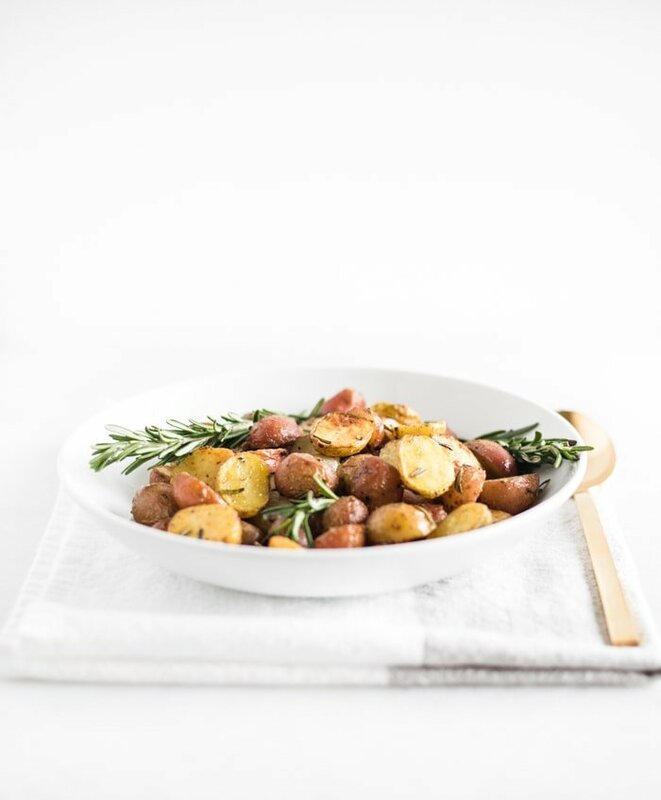 There is no need to peel them, they have minimal ingredients and prep work, and they yield the most delicious, fluffy potatoes with crispy skin and a hint of salty rosemary goodness. 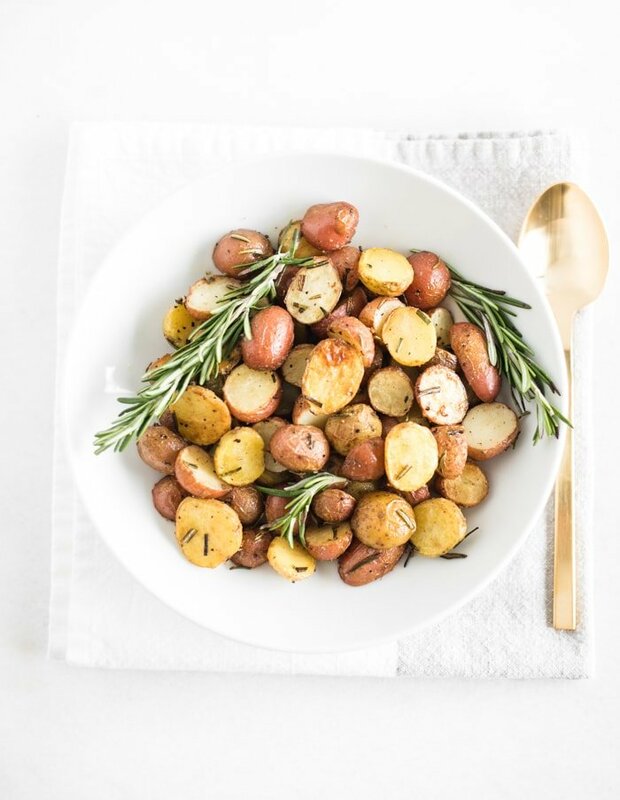 To be 100% truthful, I made these oven roasted rosemary potatoes at least once a week when I was pregnant. I had a major potato craving in the first two trimesters, and these always hit the spot. 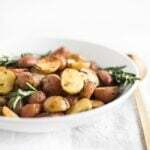 How do you make oven roasted rosemary potatoes? 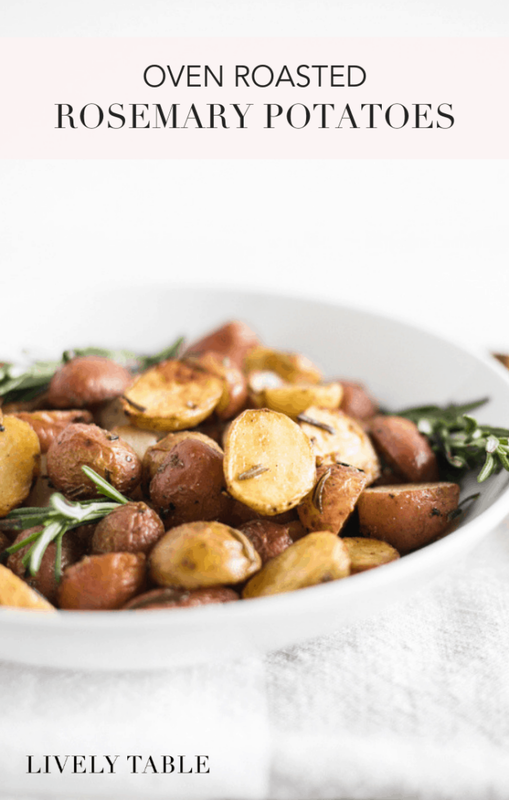 Oven roasted rosemary potatoes are super easy to make. Cut the potatoes into uniform pieces (no need to peel), toss with olive oil and a couple spices, and roast at high heat for the perfect potato. That’s it! I like to use a preheated cast iron skillet for extra crispy outsides (the starch in potatoes is also great for your cast iron! ), but you can also use a baking sheet. Just make sure the potatoes aren’t crowded, or they will steam instead of roast. What are the best potatoes to use for roasting? While type of potato will do, I like to use baby golden creamer potatoes, the smaller the better. For a few reasons: 1. Less prep work. I typically don’t have to cut them if they’re small enough. And if I do, it’s just in half. 2. They have the best texture. Thin skins that crisp up beautifully and fluffy golden insides. So yummy. But like I said, any potato will do as long as all of the pieces are about the same size. 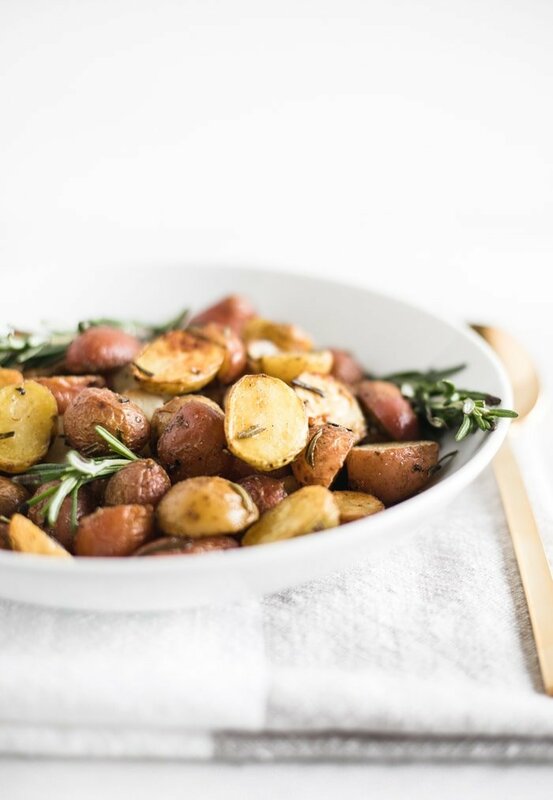 If you’re looking for an easy, healthy side dish, look no further than these oven roasted rosemary potatoes! They’re simple enough for weeknight meals, but elegant enough to grace your holiday table. Enjoy!